So we were in the vegetable section when Brit Boy’s cell phone starts ringing. He answers and it was like the clouds just parted. The landlord FINALLY authorized the fixing of our shower. Whoopee!!!! :-) The property management lady said that the contractors should be contacting us in the next couple of days to set up a day to start their work. So after many, many calls by both of us, we finally got a result. I tell you, we were so excited that we almost broke into a bit of celebratory break dancing right there. LOL. Oh boy, to have a shower again that works! After that, we just kind of skipped around the store and finished our bit of shopping. And as a bonus, when we went back to our car, the alarm wasn’t honking or anything…so it was a great afternoon, after living through the night before. :-)Sometimes the simple things just make your day. In other news, I got a package this morning that I’ve been waiting for. I had to send off to get a lingerie bag to wash delicate things. I couldn’t find one anywhere in the stores, so I ordered one online and it cost next to nothing. I ordered it because I wanted to wash two nice scarves that I bought in London when we were there in December. They were the pashmina-esque scarves (the real ones are cashmere as you may know but mine are so not). 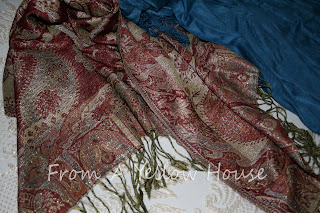 They come in all of those vibrant, rich colors and are so warm. I only paid £8 for two. They’re perfect for the winter we have been having. They come in gorgeous solid colors and patterned styles. I opted for a blue one, which is my favorite color and a patterned burgundy one. I plan to also have them to double for just a nice shawl when it warms up. Here are a couple of photos of what they look like. I love the rich colors. I figured that I would wash them in a lingerie bag so that I would save some wear and tear on them. Well Dori that is some very good news. And I hope you have a wonderful weekend. your scarves are absolutely beautiful and I'm happy you received the rest you needed. Sounds like a more peaceful day and that's a good thing! 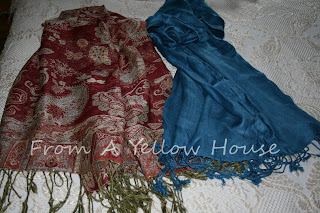 Beautiful scarves! A peaceful day and getting the shower fixed,sounds like a nice thing to me.Mugs my friend. Love those scarves and am so glad that you are getting the shower fixed! Not having one really makes you appreciate it! i'm glad to hear the tinkering worked well ;D and you got a great deal on those pashminas. i like the burgundy scarf! I love both of your scarves - I am a scarf person too :) Glad to hear that your landlord finally got round to getting your shower fixed! Yeah, peace is good :-) Have a great day! Scarves are cool aren't they...they add that little lift to outfits. I've always been a scarf and hat girl :) And we'll do a happy dance when the shower starts cascading again. Have a great day. I like your positive attitude! I'm also pleased to hear that your landlord finally got round to getting your shower fixed. And your scarves are beautiful.